Make yourself comfortable in one of our most spacious superior suites. Located on the 1st floor, this lavish room boasts stunning park views from its large colonial windows and has direct access to the open verandah. 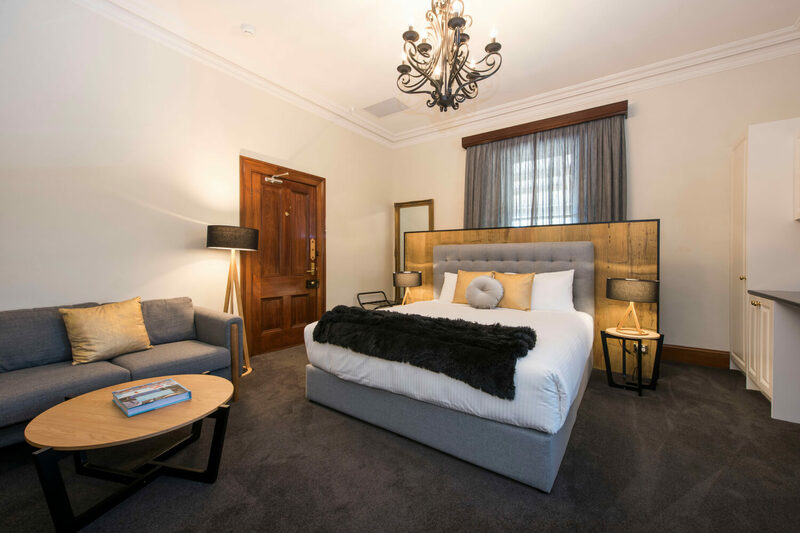 With a deluxe king bed, and a sofa bed available, the suite welcomes up to four guests to indulge in its stylish comforts. 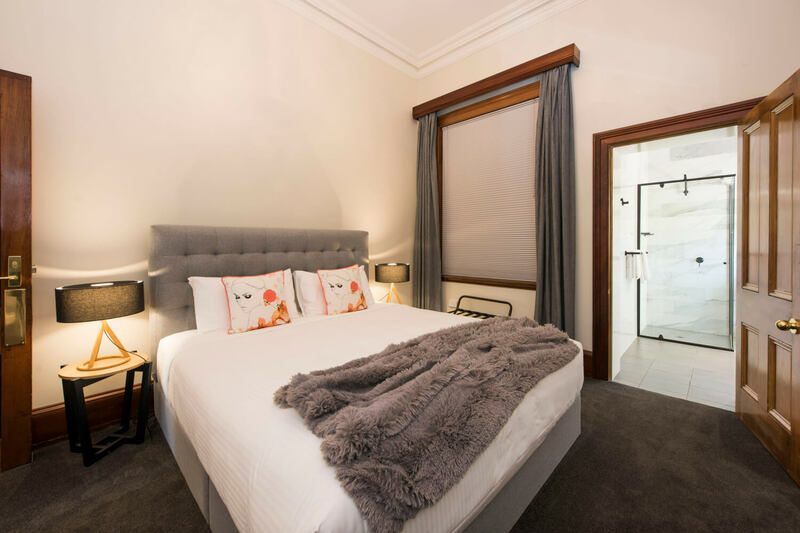 The perfect room for relaxing and unwinding after a day out enjoying Mudgee’s charms. 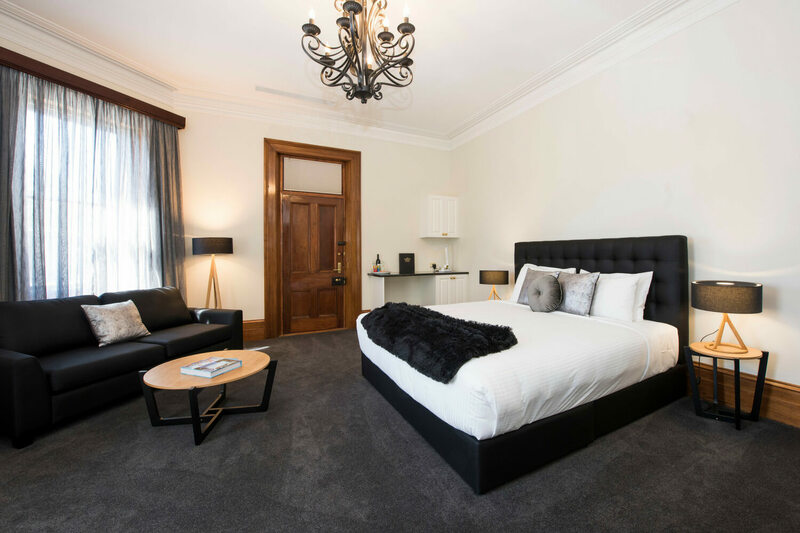 Enjoy style and space in our adjoining king suite on the 1st floor. 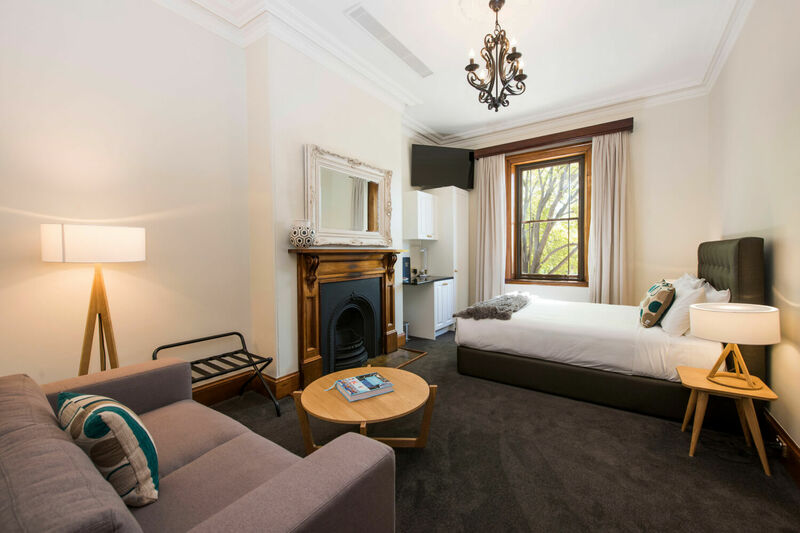 This elegant room is available on its own or as part of a lavish two-bedroom apartment for group bookings. Featuring a custom-built bamboo wall, which allows access to the large colonial windows and their views, the room is known for its truly unique design. Guests are treated to direct access to the open verandah, while the ensuite boasts the largest shower in the hotel. Sense the luxury in our exclusive one-bedroom apartment located on the 1st floor. The custom-designed apartment features a comfortable queen bed and an inviting bath in the separate ensuite. The space can also be opened to the adjoining suite, offering the comforts of two-bedrooms to larger groups. The hotel’s only apartment features a fully-equipped private kitchen with direct access to the verandah and the rattan wicker outdoor seating. Experience elegance in its most simple form with the only queen suite located on the 1st floor. The large colonial windows boast street views from above, while the spacious boutique ensuite provides yet another one of the hotel’s beautifully handcrafted vanities. Access to the open verandah can be can be found through door at the end of the hallway, just outside the charming suite. Perfect for couples seeking simple luxury in a home away from home. Known as one of the most comfortable Accessibility Suites in the region, we invite people with and without disabilities to enjoy a stay as luxurious and charming as the next. 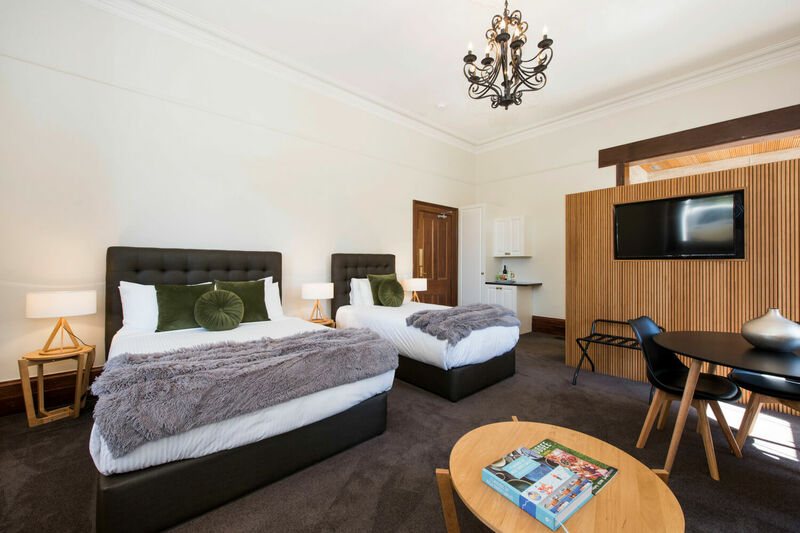 As the largest suite in the building, it’s located on the ground floor and offers accommodation for up to three people featuring both a queen and king-single bed. The room boasts large colonial windows with park views and a beautiful bamboo wall attaches to the vanity, which is separate to the ensuite for easy access. This suite prides itself on the best views of the courtyard and hotel gardens from its ground-floor windows. 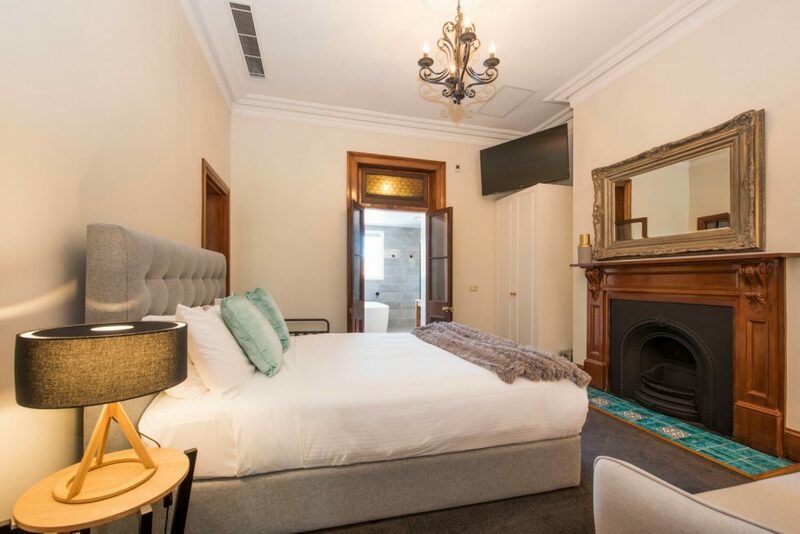 Although one of our more modest suites, guests will experience modern country elegance with the luxurious king bed and uniquely designed ensuite. The ensuite features a stunning black pressed metal ceiling and another of the hotel’s handmade timber vanities. All guests are welcome to enjoy the surrounding views from the upstairs open verandah. 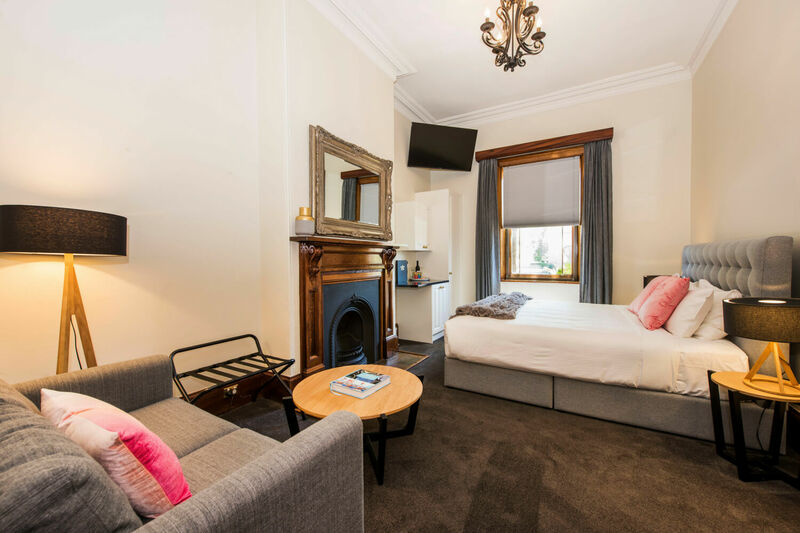 A luxuriously simple stay for couples and solo guests alike, this suite is located on the ground floor and offers one of our deluxe king beds with pleasant street views from the window. The spacious and beautifully designed ensuite features an exotic bamboo ceiling and another one of the hotel’s gorgeous handmade timber vanities. All guests are welcome to enjoy the surrounding views from the upstairs open verandah. Beautiful room, you have done a beautiful job on restoring the Parkview Hotel. I loved my stay and will return and recommend. Thank you. A real pleasure to stay in this beautifully restored heritage building – comfortable, quite and tastefully detailed. The experience complemented by the downstairs café; big thanks also to Hannah for her cheery welcome and helpful advice. A real boutique experience, thank you. We have really enjoyed our stay here. Our room was lovely – both the bedroom and bathroom. Breakfast downstairs was great – definitely loved the pancakes. The staff were also very polite, enthusiastic and helpful. We would definitely recommend this place to others.